We've been spending a lot of time on this site griping about potential McMansion development here, along with the far eastern origin of the cash that could potentially finance such things. And wouldn't you know it, our devotion to that particular topic has apparently now started to attract some reader interest in a very special faraway place. That being mainland China. Just to the left of the words you are reading now is an inset detailing the international page view figures for this blog over the last 30 or so days. As you can see, the vast majority of those clicking on The Tattler are from the United States. Which makes perfect sense. And I believe that if Google was to break this all down a little more, most of that 54,176 figure would have come from California. Or even Los Angeles County. This is a local blog, after all, and deals with things that ordinarily don't translate very well in places far away. With many Europeans probably confusing us with a popular Mexican vacation destination celebrated in a song you can listen to by clicking here. But our biggest overseas growth market for site traffic is now mainland China. With 2,407 hits in the last thirty days, or nearly double what the Mountain Views News website gets overall during one of its better months, it is obvious that we have caught the attention of interested folks from afar. I've thought about why this might be, and decided it has to be the articles on McMansions. That and there are some people here who have a serious problem with them. It is certainly not the kind of thing you'd want to hear too much about, especially if it was you that was investing vast sums of cash in Southern California on just these kinds of real estate ventures. Back on March 24 the Los Angeles Times published an article called "Wealthy Chinese home buyers boost suburban L.A. housing markets" (link). I think it adds some credence to my theories about our newfound readership. The overflow from China's economic high tide is transforming the housing markets of suburban Los Angeles. Affluent Chinese home buyers are driving prices past boom-era peaks, spawning a subset of property brokers and mortgage lenders that cater to their distinct needs — and even dictate design details in new subdivisions. The strongest magnet is the San Gabriel Valley, where Monterey Park became known as the "first suburban Chinatown" in the 1970s. Selling real estate there now requires familiarity with feng shui, the ancient Chinese principles of harmonious design. "People are getting money out of mainland China and sticking it here," said Mel Wong, president of the West San Gabriel Valley Assn. of Realtors. The trend appears unlikely to unwind soon. More than 60% of China's wealthy have left or plan to leave the country, at least part time, and their No. 1 destination is the United States, according to the Hurun Report, a Shanghai publishing firm focused on recently minted millionaires and billionaires. Despite dizzying ups and downs in U.S. home prices, the market can seem more stable than in China, where fears of a property bubble have added to the economic and political worries of the burgeoning middle and upper classes. Compared with housing prices in China, the $1.27-million Arcadia property didn't seem expensive. "The Arcadia house is cheaper," Chen said. But it's getting more expensive quickly. Heavy demand pushed the median home sales price past $1.32 million last quarter in Arcadia's 91007 ZIP Code — 30.5% above its peak in 2007, during the housing bubble, according to researcher DataQuick. Next door in the 91006 ZIP Code, prices are up 23.7%. Other areas with prices exceeding their peaks include Walnut, Temple City, San Marino and parts of San Gabriel and East San Gabriel, all hubs for Chinese investment. I guess I need to do some more McMansion articles. 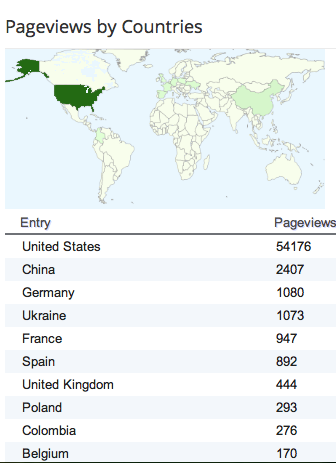 It seems there is an audience overseas that is very interested in what is going on around here. Obviously it is a growth market for blog traffic. The following article was forwarded to me by a longtime reader. The underlying issue is a serious one, and the reaction of some people in the City of Albuquerque is, in my opinion, quite understandable. But that said, we come from a City where certain elected officials practically pass out if someone speaks from the public comment podium for more than 3 minutes. So can you imagine if something like the following were to happen? Albuquerque Residents Vow to Storm Another City Council Meeting (link) - Albuquerque, NM residents have vowed to storm another city council meeting set for tomorrow just days after they forced councilors to flee following a raucous protest against police brutality. Demonstrators crowded Albuquerque city council chambers on Monday before serving a “people’s arrest warrant” against Albuquerque police chief Gorden Eden, causing him to make a hasty dash for the exit. Protesters also called for the removal of Mayor Richard Berry. Residents are irate about rampant police brutality and corruption, with Albuquerque law enforcement officers having been responsible for 40 shootings since 2010, of which 25 were fatalities. The U.S. Justice Department also released a report last month which called for institutional reform to stem “patterns of excessive force” that have dogged the police department. Residents have promised to keep up the pressure, starting with the rescheduled meeting on Thursday. “Nora Tachias-Anaya, a local activist, says protesters are planning to attend a rescheduled council meeting Thursday and will not stop criticizing the Albuquerque Police Department,” reports the Associated Press. If tomorrow’s meeting is anything like what unfolded on Monday, expect councilors to be heading for the exit doors once again. University Professor David Correia, who led the takeover the of the council meeting, said that some of the demonstrators were prepared to be arrested as they engaged in a conscious act of civil disobedience, risking a fine and 3 months in jail. Not that I necessarily recommend this kind of thing, but wouldn't it be interesting if people here in Sierra Madre felt that strongly about topics such as predatory real estate development? According to that LA Times article, we're cheap. Well I never! do you think these are Adele's investors? That is a good question. Who will be buying Mater Dolorosa? So our Development Services department is now working for a hostile foreign economic power? Thanks Mod. Heino is a musical genius. The Chamber should invite Heino to come here and sing the Sierra Madre song at the next Wistaria Festival. I'm sure that Chinese investors are monitoring the Tattler as they decide the next cities to invest in as other communities get fillled up. Sierra Madre seems to be the new focus for development and for investors.. You can bet that almost all the homes at One Carter, Stonehouse and Mater Dolorosa will be sold to wealthy Chinese buyers. Right now, they have the money and its a status symbol for them to get nice big homes. Sunday's Star News had an article titled "City eyes regulation of basements". Evidently, alot of the new homes in San Marino are being built with huge basements which offer even more room for extended families. If cities are not careful, this is how things get away from you. In South Pasadena, they declared a moritorium on the 15 massage parlors they now have in that city. Many of the houses in Arcadia are built very large to accomodate more than one family living in the home. These homes will often have two kitchens and other modifications to accommodate different housing arrangements. This is something we're not used to and its becoming more of a problem. There was an article in the Outlook about people in San Marino concerned with the tearing down of beautiful older homes. The good news is that a city is allowed to regulate what they want their city to look like or preserve what already exits. I don't mind anybody coming to our city, but if you want to change it, tear down older homes, put names on the businesses that are in a language that I cannot read, that's where I draw the line. The police in Montery Park were concerned that they couldn't read the names on business establishments and thus had trouble responding to emergencies. Let's face it, that's the reality of what is going on. San Marino is bold enough to require that folks prove residence status to use Lacy Park, or pay an entrance fee, they don't really like their new farmers' market, as it could attract unsavory types, and they are protesting the installation of bike lanes through their city for the same reason. Also, if you do want to build in San Marino, the development dept. will reject your plan with a dismissive "too grand" without telling you what you can do to get the project approved. That's right 10:57, cities do regulate their building standards very carefully. There's at least one town that requires realtor yard signs to all be a certain color. Some cities don't allow open house signs at every corner. If we want to preserve Sierra Madre, we can pass the laws and ordiances to do so. The developers will take advantage of every loop hole and I don't blame them. The residents of Sierra Madre have to decide if Sierra Madre is worth preserving. If you have multiple families living in each house, it also means you now have many more people parking on the street. This is how these McMansions utterly change the character of neighborhoods. We must learn from other cities and tighten up the General Plan. I think the people who served on the General Plan Commission didn't completely realize what is going on from a development standpoint and how strong the forces are that want to dramatically change the Sierra Madre we all know and love. In light of all this, the General Plan needs to have some further tightening. The City Council should talk to the planning departments in San Marino, Alhambra and South Pasadena for example and try to find out what problems they are encountering and then anticipate that these same pressures will come to Sierra Madre. For example, learn what happened in South Pas regarding the massage parlors. Now its too late. They are stuck with 15 of them and declared a moritorium. It got away from them. I wonder how Sierra Madre would look with the blacked out windowns and neon lights of 15 massage parlors. "You have a beautiful village." Using Chinese characters to respond to a blog in English is exactly the kind of folks I don't want in my neighborhood. No offence. If someone responded in Italian or German I would feel the same way. If I moved to another country, I would not try to change that country to look like the country I left. And yet almost all housing in the United States is built to reflect the styles of the immigrants who came here. Dutch, English, German. Why exclude the new guys? The only styles that have a native right are native structures. Like wigwams and tee-pees and aztec ruins. We do have to be mindful to make sure we are protesting the large homes, not the origin or the people who are buying them. We have a large Chinese extended family that moved next door to us that are far better neighbors than the previous neighbors who illegally rented out their garage, basement and workshop. And FYI, one of the suggestions made by the Planning Commission for One Carter is for the developers to consider basements so the homes won't look so massive on those tiny lots. If the lot is big, make a big house. If the lot is small, make a small house. If the lot is small, make a big house. If the lot is big, make a bigger house. I don't think people are protesting the orgin of where people come from. But this is a cultural difference in what people think is aesthetically pleasing from an architectural standpoint. We only have to look next door in Arcadia to see the home that are being built. The fact is I would think those McMansion are ugly and gaudy whether they were occupied by Italians, Germans, Mexicans or Nigerians. The fact is that they are all occupied by Chinese owners. They are entitled to want to tear down every older home in Sierra Madre. The residents who live here are entitled to say we don't want that. Alhambra residents are complaining that they are losing their cultural heritage. Why should people who move here from a foreign country care one iota about Alhambra's cultural heritage. Tear it all down as far as they are concerned. Tear down the San Gabriel Mission for that matter. If the residents who live in Alhambra, or San Gabriel or Sierra Madre for that matter don't care about their cultural heritage or don't mind Sierra Madre looking like Aracdia, then by all means, let it happen. 11:40 am - The previous developer of One Carter (Stonegate) sought to reduce the size and massing of the homes by creating semi-subterranean space with light wells that would not be counted as square footage, but bonus space. The current council majority at that time adamantly rejected that idea. Whether we like it or not, homes will be built there. I do not think that the council should cave to the developers, but at some point our city is going to get sued. And maybe there isn't a good case for that, but we the taxpayers will be footing the bill to defend our city. Just think about that. Every negotiation has some give and take. Let's be smart about this instead of bankrupting our city. Ah, yes cave in to demands because otherwise we'll be sued. Where have we heard that before? 12:31, go ahead, make my day! "Bess" sounds like a realtor. Maybe even one who expected to profit from the destruction of the hillsides. Our American culture is slowly being eroded. Let's nip this one in the bud. I have no problem with it. That's what Google translator is for. The Moderator is a smart guy. How do you think I posted earlier in Mandarin? How do you think I knew if I could clear it? I agree 12:32. People can respond to the arguments. It shows bad manners when you respond in Chinese. Why come to a country and try to change it and not learn the language and operate within its systems. I remember when only Valley Blvd had Chinese character signs. Then it was Main Street and now you see them on Huntington Drive. Evidently most of those businesses don't care about my business because since I can't read Chinese, I can't patronize those businesses. Please tell me why I shouldn't have a problem with Sierra Madre's Village having storefronts like I see on Valley Blvd. Why would I want that? What happened to assimilation? Having destroyed Sierra Madre, The Tattler is trying to foment WWIII. Excellent phrase. Captures the problem exactly. Contrary to many comments here, real estate development is NOT predatory if the owner adheres to our general plan and building codes. Our focus should be to get the General Plan approved very soon. It was never meant to be one size fits all. There are good and bad. I agree somewhat with 3:58. Developers will exploit the General Plan and building codes to the extent that is legally permissable. If we don't like what they are doing, we need to change the General Plan and building codes and close the gaps. We can preserve the look and character of Sierra Madre if we want to. The challenge is we have not only the developers but also a City Hall that spoons feeds information to the City Council. If the City Council doesn't recognize the real motives of City Hall and how they favor all development, then its up to the people to rise up and change things. Get involved or shut up. Sierra Madre sits atop a major earthquake fault line, has no water, massive fire and flood danger, past murders having been committed on the property, yup; thats where I want to build my home. Any Native American curse put upon the land? you are so right, 5:06 pm. yes the local Indian trips up in those mountains have put a curse on that land. What murders? All of southern Cal sits on a multitude of fault lines, we have water...what's with all the lies? I get it. You're new here. Remember several years ago, a father and his 8 year old son died in Bailey Canyon hiking, mud slides. All that mountain/hillside land is subject to fires, earthquakes floods and mud slides. Very unwise to over develop that area, nothing good can come of it. Nothing. Sounds like a web of deceit.